In what appears to be an ongoing series, this hefty collection sees both greater intervals between Hackett’s solo releases and a latterly cherry picking of those chosen for inclusion. Progressive rock in the doldrums, a growing youth market looking elsewhere and the heritage one needing another decade to mature so it could present itself like a fine wine, it all makes sense looking back on when these records first came out. While Hackett was still experimenting he was possibly limited with budgets as to how far he could take his ideas, and that may too have affected inspiration. Featured are Till We Have Faces (1984), 1988’s Momentum is missing, we pick up again sometime later with 1993’s Guitar Noir, three more missing until a clear run with 1999’s Darktown, 2000’s Feedback 86 and 2003’s To Watch the Storms, ignoring 2005’s Metamorpheus and ending with Wild Orchids in 2006. There were foreign editions (such as those for Japan) released at the time alongside remastered reissues where there have been extra tracks or differing running orders. Broken Skies – Outspread Wings appears to collect an awful lot of those obscurities, alongside live DVDs and booklets. A diverse selection that both reflect the times (production, music and with an increasing political world outlook lyrically) and presumably his own changing tastes in music, while also diving back into his creative past. This review will focus on the music, an epic task in itself. Predominantly recorded in Brazil, assorted percussionists and drummers play a large part in creating the overall sound on Till We Have Faces. Hackett’s own guitar playing often playing veers towards the rockier end of the spectrum (preparing the way for him forming GTR), and returning accompaniment is found in keyboard player Nick Magnus, and drummer Ian Moseley, his brother John’s traditional role of flautist taken up by one Waldemar Falcão. Opening with ‘Duel’ that while a bouncy middle of the road number edging into AOR has a certain eeriness in going on in the background, and menace in the repeated lyrics: “Don’t turn back”, with some added Gothic abstraction instrumentally. ‘Matilda Smith-Williams Home for the Aged’ features a rocking guitar playing over a tricky prog rhythm before giving way to a more mainstream song intercut with guitar melodies. However, he instrumental section, that’s heavy with Brazilian percussion session rarely excites. ‘Let Me Count the Ways’ proves an interesting bare-bones blues number with treated vocals and that creepiness returns with ‘A Doll That’s Made in Japan’ – Oriental sounds and percussion mingle well, syncopating interestingly, vocals chant and recant with intrigue; a song of its time that wouldn’t have looked out of place at the lower to mid end of the singles charts. This was a time when new wave had retooled itself safely for the mainstream by way of the production tools becoming more readily available, and Hackett applies them here to his own end. ‘Myopia’ is a short, power pop number that comes across as Peter Hammill in a light mood, while ‘What’s My Name’ has percussion beating away like a shop full of clocks before some dramatic keyboard interject while Hackett’s monotone vocals evoke David Sylvain while off-kilter effects sound like Eno’s twiddling on Genesis’ The Lamb Lies Down On Broadway. Next, the old BT clock announcement acts as voiceover prior to a fat funky sound with Hackett’s guitar and harmonica wailing away wonderfully on “The Rio Connection” and it proves a great noisy noodling delight. By contrast the album concludes with the hymn like pop of ‘Taking the Easy Way Out’ and less than a minute of ‘When You Wish Upon A Star’ as coda to the album. The Guitar Noir album is introduced with a forceful bluesy rock guitar sounding out over an orchestrated bolero with worldly percussion for ‘Sierra Quemada’, Hackett’s electric tremeloing and echoing out is searching determinedly. Glockenspiel and acoustic guitar drift into a Moody Blues mood with electric guitars and synthesisers adding melodies on ‘Take These Pearls’ and a slow screaming guitar returns for ‘There Are Many Sides to the Night’ before classic nylon guitar and intermittent vocals chime in, and again I am reminded of Peter Hammill (as if he were collaborating with Julian Bream). Initially I thought it was John Wetton guest vocalising on the clippety-clop percussion of ‘In The Heart of the City’ – It’s possible Hackett was writing or demoing with drum machines around this 80s period for the rhythm patterns are always noticeable, whereas the keyboards swagger with a Metropolitan pop buzz. In similar veins ‘Lost in Your Eyes’ could be The Eurythmics alongside Hackett applying harmonics, waves of guitar chords and some wild runs and ‘Little America’ harkens for MTV with its easy going swinging pop rock interspersed by sharper blasts of guitar and a long wailing and sharp lyrical solo to end on. ‘Like An Arrow’, ‘Paint Your Picture’ and ‘Dark As The Grave’ by comparison are chiefly classical numbers with vocals, and ‘Walking Away From Rainbows’ are delicate guitar notes bouncing like raindrops between clusters of phrasing. Darktown found Roger King becoming an important fixture in Steve Hackett’s career, in his turn playing keyboards, co-writing and producing as time went on. The album itself proves a forceful collection. ‘Omega Metallicus’ is deep bass pulsed funk, thrakking drums and a sonic wild feedback of guitar with collages of quirky sounds and widdly keys – A bit like King Crimson with some added bite and that band’s co-founder Ian MacDonald does indeed play on the record. The title track is a harrowing film noir number of the sort Hackett would intermittently produce, with a sax playing over a damning thud, and a guitar arcing darkly over it all. Later, the lengthy ‘In Memoriam’ will again be a spoken narrative but more like some doomed travelogue following the afterglow of Gainsbourg & Birkin ‘Je T’aime’. The contemplative classical guitar of ‘Man Overboard’ also reveals itself a reflective song of metaphoric regret. ‘Rise Again” also goes the mournful route and is rather dreary before transforming into a merry prog rock tune with some expressive guitar playing. ‘The Golden Age of Steam’ cherishes nostalgia with radio voiceovers, pipers playing and something of a Christmas festive feel to it, whereas ‘Days of Long Ago” itself written by Hackett with singer Jim Diamond is a joy – A high ended ballad featuring the late PHD vocalist’s distinctive voice, there is minor instrumentation with bare acoustic that both invokes and carries the spirit of the song. In hindsight, it reads like a signpost for the direction The Enid would travel in more recent years. ‘Dreaming with Open Eyes’ is slow rumba come post-psychedelic folk pop, with pretty instrumentation and an extended acoustic workout towards end, but it’s numbers like ‘Twice Around the Sun’ and ‘Jane Austen’s Door’ that really grab one’s attention. The first begins with a long arcing ‘Watcher Of The Skies style organ, giving way to chinking guitar with pulsing thuds evoking the interstellar krautrock leanings of Hawkwind before a piercing guitar solos over and across amid siren bellowing sustains and flurries of maddening notes too, becoming gentler with a noodling exploratory feel as it moves towards a prog textured chilled out journey. On ‘Jane Austen’s Door’ his guitar plays compelling melodies between metronomic rhythm as once more he sings about times gone by, principally the late 60s, touching on love, friendships and pop culture ranging from The Beatles to naturally Jane Austen. As the guitar solo entwines itself around the melody to fade you’re slow dancing alone in the dark. The album closes with ‘Darktown Riot’ – All tribal rhythms, dirty metal guitar and keyboard flourishes coming across like a dark Disney soundtrack. The overall impression is that Hackett wasn’t entirely at peace with himself while writing these songs, but in composing them he has finding his way back home and the success that has found him in recent years. Feedback 86 may have come out later, but were based on songs put together around 1986, supposedly for a second GTR album. It proves to a hidden gem for those of us previously unaware of it. Marillion’s rhythm section of Pete Trewavas and Ian Mosley are present, Queen’s Brian May makes appearances (his possible replacement of Steve Howe in GTR being a rumour of the time) alongside surprises like Bonnie Tyler, but best of all Chris Thompson, of Manfred Man’s Earth Band and Jeff Wayne’s War Of The Worlds fame – Many Hackett devotees have long decried him not having a strong regular vocalist in the past, and Thompson’s appearances on this album are a joy; you wish they could have collaborated further. It begins with a fine piece of AOR in ‘Cassandra’ with memorable guitar hook and tasty wah-wah rocking solo, Thompson’s voice in fine form, and overall a little reminiscent of The Alan Parsons Project. The thought occurs while listening that changing the lyrics a little and calling the song December might’ve scored them some points on the Christmas singles charts. Thompson duets with Tyler on ‘Prizefighters’ – A forgotten middle England melody gives way to pomp, circumstance and some fine balladry with the pairing of these singers proving interesting. It stands with Joe Cocker and Jennifer Beales to one side, and Peter Gabriel with Kate Bush to the other, being if not a tale of domestic violence one of marital indifferences. It’s Brian May’s turn to stand up and be heard on ‘Slot Machine’ as he and Hackett wallow in a meltdown of electric guitars before a keyboard melody over bouncy driving rhythm gives us something akin to The Thompson Twins with added nice wiry fretboard workouts. Hackett takes lead vocals for ‘Stadiums of the Damned’ wherein a Genesis style nursery musical box stance is evoked, Thompson returns for the pleasant enough ‘Don’t Fall Away’ while ‘Oh How I Love You’ proves a more stately yet sensitive acoustic number wherein he sings earnestly without syrupy over sweetness, and is followed by the classical instrumental ‘Notre Dame des Fleurs’. ‘The Gulf’ is one, very long, step removed from Bill Withers ‘Ain’t no Sunshine’ with more deserts storms blowing in its Moroccan rhythms, before taking on an uneasy progressive offbeat march with a wrath of guitar, before becoming mellower with guitar notes lengthening, twisting, and invoking terror, intrigue and quite frankly twisted fingers for mere mortal men; then it’s back to an upbeat swing with – dare we say a – a Deep Purple style blues workout in the way guitar and organ chase, beat away and kiss and make-up after each other. A great track! Having re-established a stable touring band, Hackett featured them on To Watch the Storms. 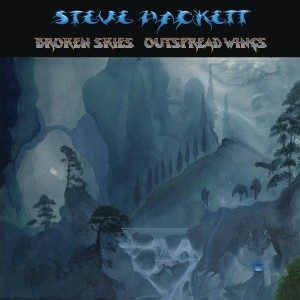 Alongside King on keyboards, Gary O’Toole on drums, there is the featured return of John Hackett on flute, Ian McDonald on sax, but importantly Rob Townsend begins to show form on assorted wind instruments and there is a rekindling of the ethereal spirit found on his earliest solo records. ‘Strutton Ground’ might be John Wetton fronting a gentle Genesis, while ‘Circus of Becoming’ features guitars spiralling out of tune even as an atypical George Formby rhythm strums away underneath in a weirdly wondrous manner. Thomas Dolby cover ‘The Devil Is an Englishman’ features a debonair dandy narration over funky bass beat, weird effects and female backing, while ‘Frozen Statues’ is minimalist jazz, sweeping keyboards and horns with experimental sounds aplenty. Bigger, ballsier with swinging jazzy rocking prog one moment, dramatic like a film soundtrack the next, with avant garde come space rock excursions too, ‘Mechanical Bride’ makes you stop and listen, and the quieter classical guitar and piano of ‘Wind, Sand and Stars’ a gentle respite before the Thumping upbeat prog of ‘Brand New’ bristles with guitar work with the kind of stuff Satriani and Vai reach for, but affect less character with. ‘This World’ feels a return to earlier folky-pop tunes and sounds rather like Peter Skellern singing an ealry Chris de Burgh tune before searing sustaining guitar solo draws it to conclusion. ‘Rebecca’ eases us back in with acoustic underpinned by bass before the dreamy ballad then gets all nu-prog with weirdly wonderfully keyboards and twisting guitar. Initially it sounds like a whale crying out then realise it’s some Asiatic trumpet proclaiming ‘The Silk Road’ is open for business – Eastern percussion rolls out, all very evocative, but when the treated voice come in it does quite gel. On the contrary ‘Come Away’ may well be just a psychedelic sea shanty but it works, and the last two numbers follow gently, ‘The Moon Under Water’ a charming classical acoustic piece, ‘Serpentine Song’ pleasing whimsy, with acoustic, flute and the like blowing the cobwebs away. The studio side of this collection ends with Wild Orchids and tends to bob and weave between the musical styles of the previous albums gathered herein. As such it solidifies an identity for the Steve Hackett who is once more recording hit albums internationally, though it must be said the songs themselves aren’t quite as potent as the previous release. Presumably having had an early interest in steampunk prior to the terminology coming into existence, clockwork whirring gives way to Gothic threatening and fiendish electric guitar on ‘A Dark Night in Toytown’ plays with Hackett’, world music gets an airing with the bhangra beats of ‘Waters of the Wild’, “Set Your Compass’ takes us back to the dreamy entanglements of Genesis, ‘To a Close’ a hymn like lullaby, ‘Why’ another of his odd radio voiceover things, fortunately brief, and ‘She Moves in Memories’ warm with gentle keyboards and an orchestrated classical feel. I suspect ‘Down Street’ won’t be to most people’s tastes, but if you could dig a Peter Cushing narrated voice replacing a Boris Karloff one on a Monster Mash style number with skewered New Orleans jazz that bumps off into Zappa orchestrating a proggy Tom Tom Club give this a listen. It’s rather fun, and needs playing out to the end as Hackett delivers an ace harmonica solo prior to his six string howling out into the night. Mentions of which should also have us note an interest in wolfs and werewolves begin here, replacing previous semi-vampire flirtations with ‘Wolfwork’ being another slow paced film noir progger, and ‘Howl’ a screaming instrumental that the records closes with..
‘Man in the Long Black Coat’ is a curiosity, being a Bob Dylan cover, though the vocals sound more like Leonard Cohen here. Mind you, it works, as an acoustic bayou blues with a slight Celtic undercurrent. “A Girl Called Linda” is artwork of good breeding, marrying latterday Beatles with early 10cc, while a whispery flute solo over a walking bass line meanders nicely. Hackett’s mind still isn’t quite settled however as ‘affecting narrative of The Fundamentals of Brainwashing’ reveals, alongside the wiry screaming guitar and chugging accompaniment of ‘Ego & Id’ that seems to indicate where those diversions towards a more pop music sound in previous years were trying to get to, a place where Gothic rock met the artier sounds of the Big Music. And now, having got there, he was about to move on.